President Choi and Board Chair Marcy Graham take questions from the media following the April board meeting. 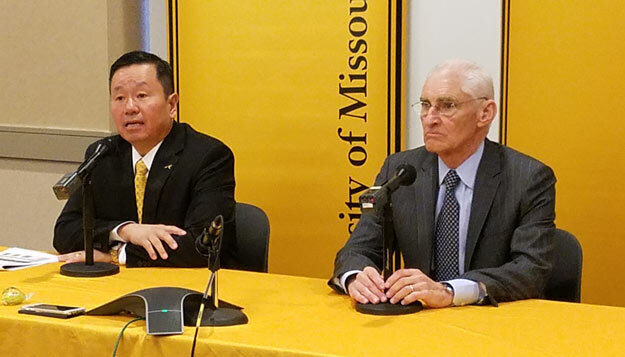 President Mun Choi officially delivered his first report to the University of Missouri Board of Curators, and the board approved important new amendments to the University’s Collected Rules governing faculty and performance, highlighting the board’s recent Spring meeting in Rolla. The April 27-28 meeting at Missouri S&T was also the first for three new curators, included a touching goodbye to three key UM System leaders and the official appointment of an interim chancellor at S&T. “We have to truthful with ourselves about where we are,” said Choi. And while the budget process is dominating talk at all levels, President Choi said the system will remain a comprehensive university. He specifically cited programs to add faculty, expand research and provide more support students at MU and S&T that will not be delayed until revenue for the University rebounds. During the meeting, curators approved important changes to the University’s Collected Rules that govern faculty workload, performance and conduct. The changes resulted from a review conducted in the past year by the University’s Intercampus Faculty Council and academic officers, and will require regular performance reviews for tenured faculty and academic departments setting teaching workload requirements for each faculty member. “These modifications will bring more clarification to the annual performance review of faculty and post-tenure review process, which will benefit the University significantly,” said Board Chairman Marcy Graham. There were a number of transitions at this board meeting. Three new curators were sworn into office after approval from the Missouri legislature. Curators Darryl Chatman of St. Louis, Jamie Farmer of St. Louis and Jeff Layman of Springfield each began a six-year term. The board approved the hiring of Dr. Chris Maples, former president of the Oregon Institute of Technology, as the interim chancellor of Missouri S&T. Dr. Maples is replacing outgoing Chancellor Cheryl B. Schrader, who previously accepted the position as president of Wright State University in Dayton, Ohio. Dr. Maples appointment as interim chancellor is for one year, which he will officially begin on May 15. A national search for a new, permanent chancellor at S&T will begin in the fall. The board also presented resolutions to three outgoing leaders, including S&T’s Schrader; MU Interim Chancellor Hank Foley, who has accepted the job as president of the New York Institute of Technology, and Michael Middleton, who has returned to retirement after serving as UM System interim president from November 2015-February 2017.